Tubing misconnections are medical errors that can lead to severe personal injury or death.These errors often happen when a doctor or a nurse mistakenly connect tubes for different functions together, for example connecting a feeding tube to a tracheostomy tube. To avoid these type of errors, new ISO standards have been developed for tubing connectors. The objective of these new connectors is to make it impossible to connect tubes used for different functions. The first ISO connector standard has already been adopted and others will gradually be introduced and adopted throughout 2014 and 2015. 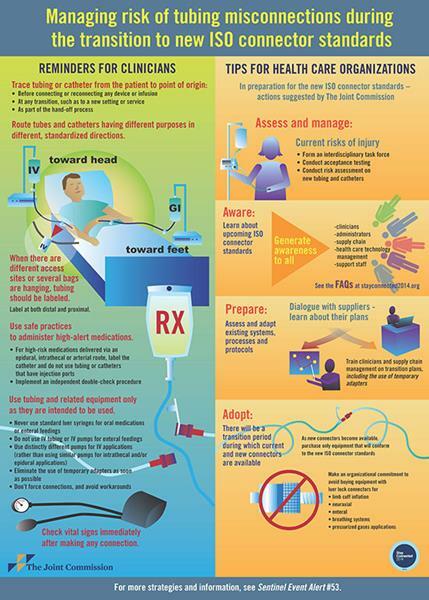 During the transition phase however new risks of tubing misconnections will arise and the Joint Commission is urging hospitals and healthcare providers to take all necessary measures to prepare for the new standards by building awareness and communicate across their facility, prepare and train the staff, adopt the new connectors and measure the accomplished progress.